This was the 2nd Rand Airport Easter Rally, the event being part of Rand Airport's Easter Open Day with many activities for the family. It was primarily a Fly-in with the Airport waiving landing fees and reducing fuel prices to attract visitors from out of town. With the success of last year's event, another Adventure Rally was planned in the style of the EAA Sun & Fun rally events, which of course is all about answering clues and finding Easter Eggs. The route map - showing the partial route. The Adventure Rally format is a more relaxed fun kind of event mostly involving observation out of the window recognition of ground features and learning about the area being flown over, rather than the high workload of accurate timing. It is important to have a good crew cooperation on roles and responsibilities, and given the comments heard from the participants after the flight, it seems some cockpits had some hilarious moments. Rand Airport Easter Apron with DC4 and competitor aircraft lined up. 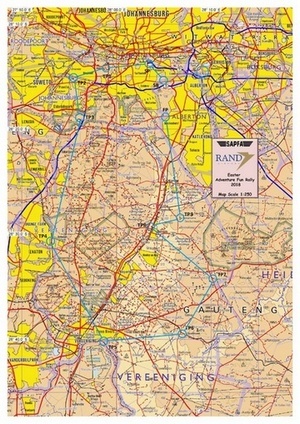 The route was initially planned out to the west, overhead Nasrec and the Orlando towers, but inadvertently when the route planning was done it was forgotten that the Rand Easter Show would also be on with plenty of SAAF demonstrations, thus with the Notam issued with a 5 nm exclusion zone, had to re-route the start and first two turning points, within 1 day of the event happening, no pressure…. A typical leg task sheet in the booklet. 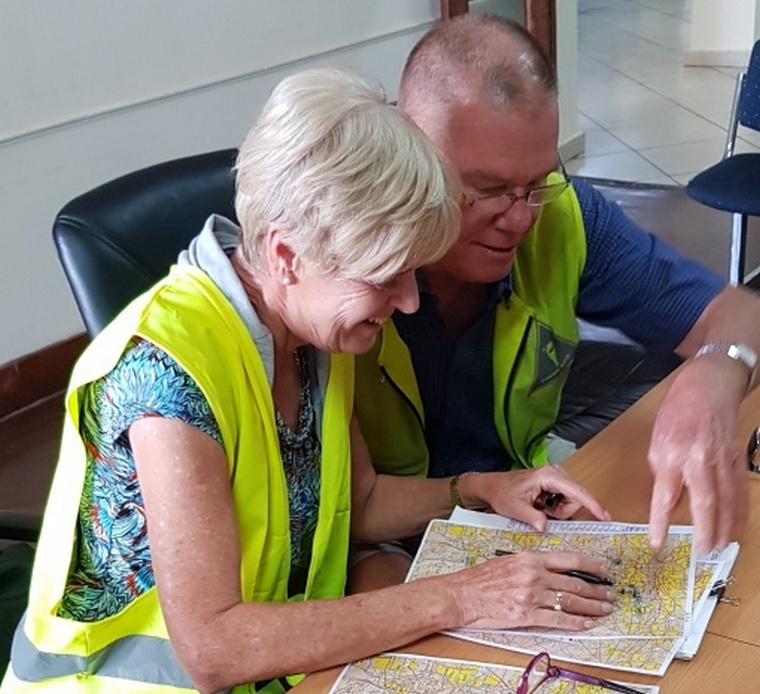 The route was planned on a 1:250 000 map with all turning points marked up - with Martin the invigilator for the day - having to mark up the revised turning points. The route essentially started out south-west of the silver ball, at the Glenvista Country Club at a small pan at the 12th hole, complementary to the original start point Wemmer Pan, from there further south to the Rand Water Zwartkopjes pumping station which also has an associated Recreation Centre, from there westwards to the Olifantsvlei Nature Reserve with a sharp turn southwards towards Three Rivers and the confluence of the Vaal and Suikerbosrand river. From the Vaal river the route went up north skirting past the Suikerbosrand nature reserve and then crossing the two airfields Circus and Kliprivier, the photos having been swopped around to confuse everybody. From Kliprivier up to the finish point Romeo Delta past the Heinken Brewery and Panorama Airfield. Competitors plotting the route. There were 14 crews registered prior to the event, eventually 11 taking part, with some competitors having had difficulty in arriving with low mist from the east. The weather was mostly good with some rain showers predicted and at one point at around 11 ATC was about to declare IMC with weather moving from the west, which thankfully stayed away. Ian and Adrienne Saunders Plotting. After the 8h30 briefing, and with 20 minutes prior take-off of handing out papers, the first competitors took to the skies at 10.15, with the last off at 11.20. The livetrack24 Google Earth image of two of the interesting tracks. 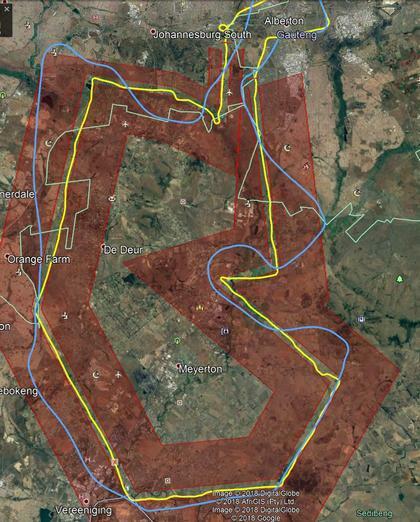 As with some previous rally events, livetracking was done and displayed on the big screen in the briefing room, where two tracks were being followed by spectators with great interest, both tracks doing pretty well, it did appear the Zwartkopjes pumping station proved a little elusive, as well as Kliprivier Airfield with some competitors having zoomed straight past it getting close to the CTR bufferzone before correcting their flight path. So, what were those gems the competitors struggled with….. the N1 being part of the Cape to Cairo road…., that Boswell Wilkie have / had their home base at Circus Airfield, then of course getting wrong the airfield pictures that showed Kliprivier instead of Circus, and what beer the brewery made…. All of them…. With everybody successfully home, it was time for marking the exam papers which was left to Invigilator Martin Meyer, between the clues and photo recognition, a total of 39 points could be scored. In the interim, I got to download the loggers to mark up the corridor excursions, which counted time penalties. When all was tallied up, there was an outright winner with Frank & Cally Eckard, and it was Cally's excellent quiz answering skills that brought home the prize, with Frank's flying accuracy even with the flying corridor cut in half for being a Protea, having registered as Xtra-Fun. Many thanks are extended to Carolle Olivier assisting with the administration of the event, Stuart Coetzee the Rand Airport Manager for all the arrangements .The prize-giving resulted in the top 3 places winning stunning laser cut aircraft and Easter hampers, the winner also winning 100 l of fuel, many thanks to Rand Airport management for the generous prizes on offer. Thus came to the end of a hopefully enjoyable day for everybody who took part, with a reasonable field size, and hopefully will increase for next year.